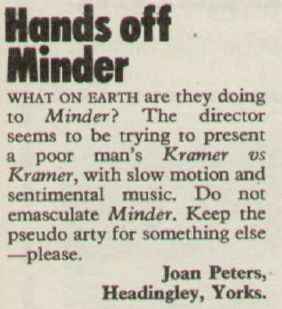 Probably my favourite episode of Minder. I remember watching it as a kid and being brought up by my Mum on her own, I wanted Terry to be my step dad and play football with me, like he did with the kid in the episode, we would have been around the same age. It's amazing the things that stay with you from when you were a kid. When I met up with jno, 2 weeks ago, I mentioned the montage at the end, where Terry thinks about him,and we had different opinions on it. I recall watching the it with my mum a while back, and she said "awww, sad wasn't it?" I think Terry enjoyed his time with Peter a lot more than he thought he would. I don't think he ever imagined himself as, or ever wanted to be, a father, preferring the lifestyle already had. Being forced into becoming Peter's temporary guardian brought out another side of Terry that he probably never knew existed and possibly left him wanting something he was previously never interested in. Thinking about it, seeing Terry taking him on a boat on the Thames, is the exact thing my late uncle Arthur would do. My family are all from the east end, but my mum and dad moved to Maidstone in the 1970s. I would stay with my uncle Arthur for the first week in August (I can always remember it would be the week of the queen mother's birthday) and he would take me all over London, including the boat trips along the Thames, where we would end up at Greenwich. This episode seems to be the one I recall the most when thinking about the show, especially from the earlier years. A very different episode that stays with you. Another thing that didn't quite ring true for me was the mother abandoning the boy at Terry's flat and disappearing. Whatever else was going on in her life this seemed a bit unwise and more than a bit neglectful. I'd never really considered that and it's true. I think she keeps an eye on him from a distance though until Terry arrives, doesn't she? You have to have a bit of poetic licence in film and TV, finding a balance is the hard part, Minder usually kept it authentic. In the end everything worked out. I don't remember seeing this shot when I watched this when it was broadcast recently. Probably this is just my own lack of attention but I am wondering if it might have been edited by ITV4 to make more space for soap powder and loan adverts. I don't think it is still available but if it is I will have a look. The scene with the boy's Mother watching from over the road is not in the version I watched on YouTube recently. Also not a fan of the sentimental closing sequence - seems unconvincing. We already know Terry is a good bloke who does the right thing, but there is never any suggestion he fancies being a parent in the series is there? I disagree Celvin, I think Terry warmed to the idea of being father in this episode, I think Arthur was more worried Terry became a Dad more than Terry was. A very fine change of pace episode. 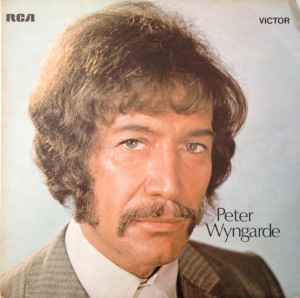 Warren O' Neil does a good job as Peter. Thankfully he doesn't suffer with a case of the cutes like so many kids plague American shows with. I read the article about him. Does any one know what became of Warren? In a word, no. I have tried over the years to track him down but nothing doing (yet), only a very very weak lead. It seems that he stayed in the television industry. According to imdb, he seems to have made a career for himself in animation and design. jno, the guy must be living under a stone if you can't find anything about him. Must add my voice to those who don't like the ending, even though the rest of the episode is very good. 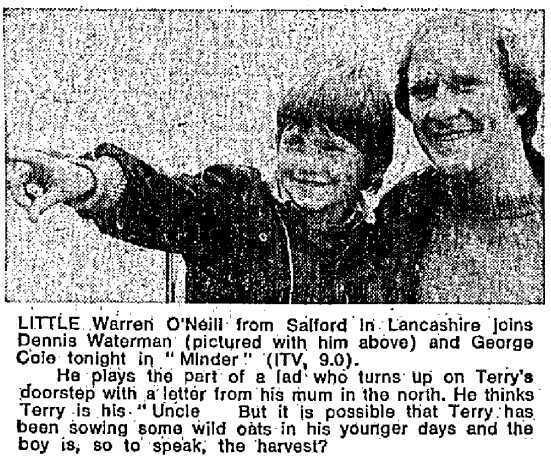 I'd have liked Peter to have been Terry's son, even if he was never mentioned again in Minder. It was very cruel of Beryl to lie to Terry, knowing that he's a good bloke. As ever, great interplay between Terry and Arthur, who I think was quite jealous of Peter. Terry is a good bloke and I don't think he'd be willing to have no involvement in Peter's life if he was his father. It seems to me Terry would certainly meet any financial obligations he may have as a father but I can't see him being physically absent from his child's life. Even if It turned out Terry was Peter's father but never learned the truth it could have caused problems for the series. Such a revelation might have created an expectation in the audience that someday Terry would learn the truth and they would be waiting to see it happen. A current tv show would likely take that approach if it used a similar storyline. Totally agree with the above two comments. As Zimbo says, there is jealousy there from Arthur. It's all very well crafted this one. At times Arthur displays a bit of a. dark side, for lack of a better term. Small does of Arthur being truly rotten are ok. I think it would have hurt the character of Arthur Daley and the series Mindsr to see him being jealous of a likeable little kid in more than one episode. Yes it wouldn't have worked beyond an episode. It was a good single episode though. I liked the tie up with the mother lying to Terry at the end. I have to be honest, I wasn't a fan of the cheesy sentimental slow-mo bit at the end. It was good when Peter's 'Dad' shows up and bursts into the house, Dicken Ashworth provided us with a very bull-headed menace. Now something that's been bugging me was, what was that whole 'bird in the bush' scene all about? When Arthur is sneaking up on T,P & P playing football in the park?? It's just such a weird thing to write into the script? It's not an in joke or running gag that I've never noticed before is it? Did Cole put his hand on something else and it was written in later and the bird noise dubbed on? Or was it intentional? A) Show that Arthur is rubbish at sneaking up on people. B) Arthur is kind of out of sorts or has a devolvement with nature. C) It is symbolic of the disruption of the 'nest', or family. Apologies if I sound like I'm being whimsical or talking nonsense, but I just thought it bizarre. This is a good episode, but the ending is a barf bag moment. Very sickly and sentimental. Not keen, tend to go straight to Beer Hunter on the DVD. Average for me - like The Beer Hunter, it needs a decent back story like Arthur trying to get rid of some dodgy gear to give it a lift rather than concentrating on the Terry/Peter story. I can see the storyline having its merits but it just doesn't seem like Minder this one. The weakest of this series for me. A line that makes you chuckle , is when Arthur refers to the North of England as "Black Pudden Country"
Just watched this one again. I like it a lot and think it's a great episode. I appreciate that they tried something different and it's a good showcase for Terry at a time when Arthur was becoming prominent. Peter is a likeable kid and the scenes with him and Terry are very well done. I was amused when Terry has to explain slang terms to the boy. It is a bit shmaltzy at times but I don't think it goes too far. Certainly not as far as it could have. I don't think the montage at the end is unbearable but I do get why some people don't like it. Arthur has some good moments when he isn't being a jerk about Peter. Water damaged umbrellas. Brilliant! A good episode but a bit overly sentimental in the end.